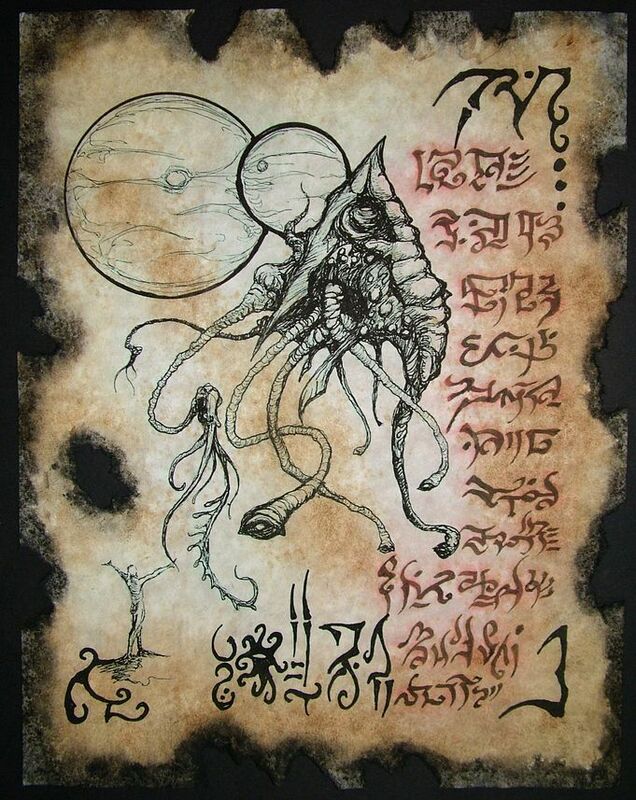 Beyond the worlds we know, beyond Yuggoth at the rim, beyond Almuric where savages battle endlessly and beyond Nh'ule of the black towers, there rolls in a strange orbit the world god Gauru-Yoth . The world thing circles seven stars, three are red and old, four are dim and older still. The seven stars hold Gauru-Yoth in check. But even the stars die and one of the seven shall someday go cold then shall Gauru-Yoth be free to roam among the stars and devour all life. 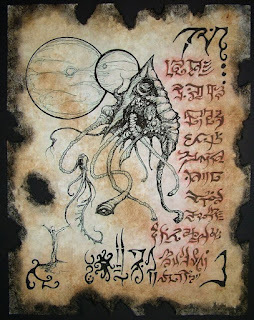 Azathoth has power to bind the world thing, but Azathoth is mad. By certain formula a skilled wizard may open the gate to Gauru-Yoth and if the Guardian of the Gate deems the traveler worthy he may go forth onto the surface of that sentient world. There he will be watched by countless eyes and will hear the screams of countless mouths, all beings that have been consumed by the world god in ages past. Some of those voices will speak and the adept may learn powerful formulae and lore of elder times. 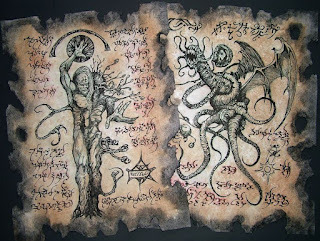 Some of the voices are simply mad and will plead for release from Gauru-Yoth or plead for the mercy of death. But their is no release and there is no escape in death, for all that Gauru-Yoth consumes lives on in his substance. 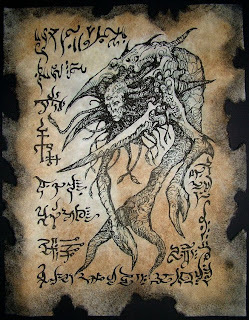 When the adept prepares to return to his world the Guardian of the Gate will bid him to feast upon the flesh of Gauru-Yoth, and thus will the adept become one with the world god and carry the essence with him. 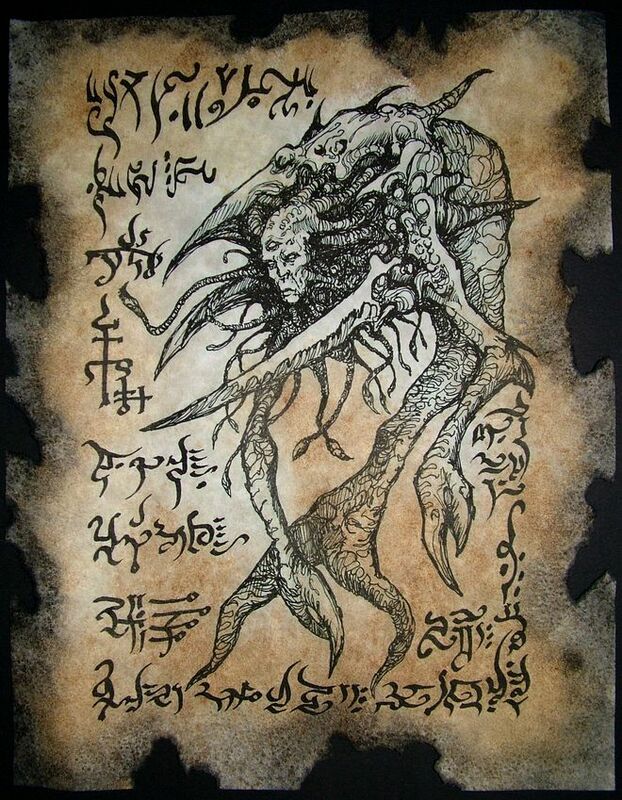 Over time the body of a man will take on the cast of Gauru-Yoth and become an unspeakable thing, taking on the appetites of Gauru-Yoth, ravenously consuming man and beast alike. After much carnage this thing will grow to a great size and the world god will call him back, there it will sink into the mass of Gauru-Yoth and live on eternally.